A few years ago, we began the tradition of taking annual photos of Mac and his cousin Alex (Ryan's brother's daughter) in their Christmas pajamas while they were in town for Thanksgiving. The first year we did this (photos here), Mac was about 6 months old and could barely sit up by himself. Alex was almost 2 and did not want anything to do with me or my camera (I think she was slightly terrified of me). The photos are hilarious - you can see the parents on the side of the photos grabbing the kid by the arms to keep them from falling out of bed or running away. It was a fiasco! But so much fun. The next year went much better (photos here). Alex was almost 3 and loved jumping on the bed and smiling for me. Mac was only about 18 months old - he did great for a while, but had limited patience for yet another mommy photo session and fizzled out, leaving me with a super smiley Alex hamming it up and loving all the attention. Since we took those photos, a lot has changed. Both Mac and Alex each got a new baby sister the following year, making travel for the holidays impossible and thus no photos. Womp womp. Last year was also a miss, due to... (honestly, I can't even remember what we did last year - I'm losing my mind). Anyway, we were able to pick the tradition up again this year while the Chicago crew was in town for Thanksgiving and let me tell you...wrangling four wild kids and trying to get them all to cooperate and look at the camera and maybe even smile is HARD. How do photographers do this? None of my usual bribery tricks (candy, candy and more candy) worked (on my kids). Alex and Addy were actually both super easy to photograph. Alex loved the camera and was my rock star little model. She's the only one smiling in every single photo. Almost 6 year-olds are awesome! Again, the shoot was a total fiasco, but totally fun! I know this is complete photo overload, but they are all just too funny not to post. I didn't get a single "money" shot of all four of them happy (or even really looking at the camera), but I got some super cute ones of just the girls and scrolling through the photos tells a hilarious story as you watch them interact all with me and each other. Their expressions just kill me! Alex with that big happy missing-tooth grin. Mac with his bored face and look of utter humiliation. Mim with tears in her eyes and dreaming of donuts. And Addy is sweet as can be, slightly bewildered by them all! You can really get a good sense of their personalities just by looking at these photos and I just can't help but share a million of them. I just love them all so much (the photos and the kids). If you've got photos of your little ones in their holiday jams, I hope you'll share them with us. 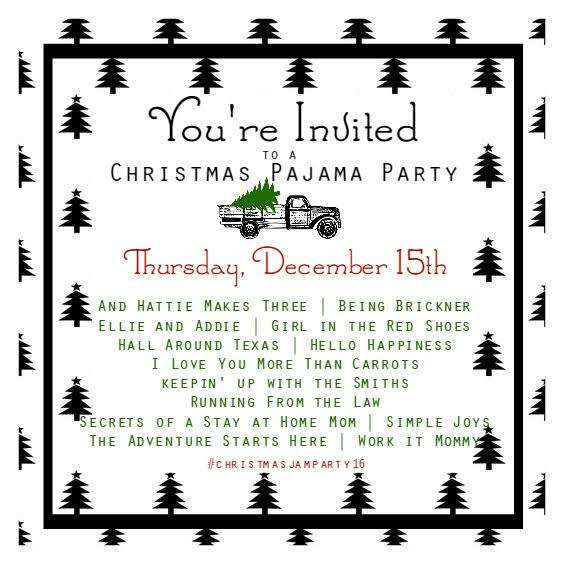 Link up below or tag your photos on Instagram using the hashtag #ChristmasJamParty16. OMG these made me smile!! Mac's bored face is awesome. I feel like i can hear the giggles from the girls. Adorable! I love it! We will be spending Christmas Eve with Noah's cousins so there will also be four kids in pajamas. I now really want to pile them all into a bed and start snapping photos!!! Oh these are darling! Alex's hair is just beautiful! These are precious! I seriously love Mac and his love for picture taking, but love his little grin at the end!! OMG! These are amazing! I love the bored faces and the one of Mac TOTALLY glaring at Mim and starring her down when she fell over. These are the best! This is such a fun tradition! I wish we lived closer to all the cousins to do something like this. Your first and second favorites are the best. Mac's face is PRICELESS!! I love this tradition! And the fair isle print is always my favorite from Hanna! These are all so great! I love this tradition of yours. I think my favorites are the 'over it' and the hugging photos. So darn cute! Precious jams, too!